I would also add that it is also interesting that Aquitania was the location of a strong Cardial outpost slightly seperated from the Portugese and Med. groups probably having come up rivers from the Med. to Biscay. That is another hint that Basque may originate in the Cardial element along with Sardinian and perhaps also Etruscan. Yes I know all about the Cardial Ware in Aquitania and mention it in my text. Etruscan has nothing to do with Basque, as far as anyone can tell. The Etruscans arrived from Anatolia long after the Neolithic - around 1200 BC. To be frank the constant attempts to link non-Indo-European languages of Europe together seem mainly to be based on the false premise that there would be only one Neolithic language in Europe. Most unlikely. The relationship of R1b and various languages is certainly not simple and straightforward. Things will get clearer eventually as we get more aDNA. For the moment I'm using logical deduction. In all the data you've just shown, brana is significantly closer to the h/g Swedish than to otzi and the sardinians. (I was a little off in that the h/g Swedish were partly described by the "atlanto-med" component and even more so for brana). The relative similarity between the brana and h/g Swedes is very obvious in the first chart. It is less obvious in the second chart but that is probably because of the "east asian" in brana, which probably eats up the "North European". So all the points stay them same. Brana (mesolithic iberian) is very different from otzi (likely a neolithic replacer for western Europe). However, given that brana has more "atlanto-med" than h/g Swedes AND modern Northwest Europeans have the most "brana", I now strongly suspect that "atlanto-med" is actually part European mesolithic. Is this the point you wanted to make? But again, the possible mesolithic component in "atlanto-med" would not be centered in meso iberia, but meso southeast Europe. Jean, in relation to your quickly deleted post, I have done nothing but archaeology for a period crossing 4 decades. I dont need to be lectured on pots are not people etc. Granny, sucking eggs and all that. In fact the very point of my post is that pots and people are not the same so I dont know where you are coming from at all. You need to read it again and please accept people are going to have their own ideas and not just shout down dissenters from your own model. I appreciate all that you do and the great help you give a lot of people but I wish you would be more tolerant of other views. Forgive me for getting a shade exasperated. As you realise, you were not meant to read that. Why do you assume me mentioning Cardial in Aquitania is aimed at you or your text like I was implying you dont know about it. I am sure you are well aware of it. I totally agree with the last paragraph but a language family in one culture like Cardial or at least the western part of it who remained in touch slowing down differentiation is possible. Cheers. Thats OK. Passion for ideas can do that. Yikes, all of our theories are clashing right now. lol I thought that as soon as I posted it. Well again, if I post something that some agree and others disagree with passionately its a good way to get the main arguements put out there. BTW I should point out that when I am saying Cardial I just mean in terms of distant ancestry, I dont mean there was a direct Cardial-Beaker sequence. Clearly that would be wrong as other cultures intervened. I also do believe some eastern pre-beaker elements must have made it to Iberia due to the copper working etc so I am not dismissing that idea at all. I am just not sure in my own mind if this was R1b. One chap in the right sort of time and place in the pre-beaker copper age of western Europe (the ice man chappy) was not but I am not mad enough to deduce anything from a single ancient chap. Well I wasn’t aiming for Oetzi, but in fact what I was trying to show was that the La Braña Mesolithic HG were more akin to NW Europeans, whereas the Swedish HG were more akin to NE Europeans. Also, something else I noticed was that the La Braña individual appears like a mixture of the Swedish HG and the Swedish farmer Gok4. Even in the MDS plots one could sort of visualize where the La Braña individuals would plot (on the border of the Brits), and how they would be equidistant between the Swedish HG and the Swedish farmer. Well, like I said on the K12b chartthe Swedish HG are all 70%+ North European, and it is their principal component, La Braña is 45% Atlantid_Med, and 41.6% North European, so they are more Atlantid_Med than North European, on the other hand Gok4(Swedish farmer) was 81% Atlantid_Med and 5.5% North European. On the MDLP5 chart what makes La Braña different from the Swedish HG wasn’t just the East Eurasian, but the fact that La Braña were 44.14% Paleo-Mediterranean, whereas the Swedish HG are only half of that ~22%, on the other hand the Swedish farmer was 66% Paleo-Mediterranean. I agree, but the La Braña individual is about as different from Gok4 (Swedish farmer) as he is from Avj (Swedish HGs). However, given that brana has more "atlanto-med" than h/g Swedes AND modern Northwest Europeans have the most "brana", I now strongly suspect that "atlanto-med" is actually part European mesolithic. Well, what we can say is that in the ~1000 SNPs used so far in the K12b run, La Braña does appear to be more Atlantid_Med than the Swedish HG in their ~20,000 SNPs analyzed. I would however say, that things could change a lot once the full genome is sequenced and the number of SNPs goes from ~20,000 to ~700,000. Is this the point you wanted to make? But again, the possible mesolithic component in "atlanto-med" would not be centered in meso iberia, but meso southeast Europe. How so? Why would it be a Mesolithic component from Southeast Europe? Mind you, I’m not disagreeing with you, I’m just curious. So according to your hypothesis, then any pre-Beaker y-DNA analysis in Iberia ought to yield a non-R1b result. It would be good then to see what the SJAPL site (circa 4000-3000 BC) in Alava which is located in the southernmost fringe of the Basque Country yields in terms of y-DNA. Well I am not sure at all but there has always been doubt in my mind about the idea of R1b being located in the west in pre-copper age times. Some interesting possibilities have been raised but any pre-beaker trail remains subtle and a matter of interpetation rather than self evident. Ancient DNA would resolve this. As you say pre-beaker copper age Iberian burials and of course early beaker period burials in the west and south Iberia, southern France area would help resolve this. Goes without saying that we need a better range of yDNA, starting with at least a hanful of samples from seperate burial sites (i.e. not lots from the same potentially 'family' burial site) from each culture. That would be a starting point. Not enough to prove absence but can certainly prove presence. 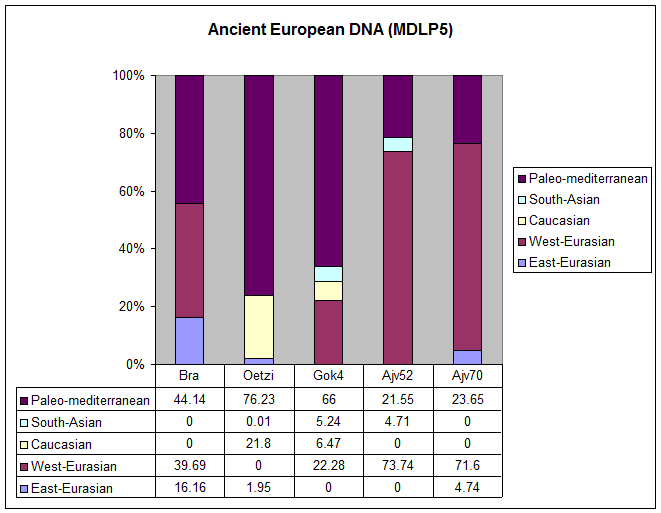 If you take the Archaeological, Linguistic, Cultural and Genetic evidence from "Celtic from the West" which linked Bell Beaker to Celtic Migrations and look at this additional DNA study From Patterson et Al. which place the influx to and expansion from Iberia by the Bell Beakers in the 3600 +/- 400 timeframe which corresponds to the findings of "Celtic from the West" we begin to see a convincing pattern emerging. How so? Why would it be a Mesolithic component from Southeast Europe? Really. We have anthropomorphic stelae all the way from the steppe to Iberia and you don't think that scholars are capable of recognising this very obvious piece of evidence. You feel that the large number of cultural similarities between the Copper Age arrivals in Iberia and Yamnaya, listed by H and H, are going to be ignored by the world of scholarship. You feel that the papers discussing the similarity of motif on Bell Beaker pottery and on the stelae, and the fact that BB people were clearly related to those who made the stelae are going to be ignored. You feel that papers pointing out that Bell Beaker pottery in Iberia was encrusted with bone paste, a method first found on pottery in the Danube Basin, are going to be ignored. You feel in short that the huge body of evidence that has amassed is going to be ignored because it does not suit a certain agenda? Very interesting. Wow, do I feel all that? I wasn´t aware. Certainly I didn´t say anything about any agenda. Jean, I don´t have any feelings on this story, what I said, and keep saying is that, as today, you will not find much people in university supporting your idea, at least for what I know certainly not in Spain. I feel comfortable with Rich Rocca's "L51 from the West" with hotspots in the Rhone, Alps, Northern Sardinia, Tagus, Erne. I feel comfortable with L23 in the Balkens where Neolithic farmers from Anatolia (M269) met horse mounted People from the Steppes (R1a). I believe this weeks Tyler et Al paper supports an R1b-M269 Neolithic expansion from Anatolia circa 5 -10 KYA. I believe this weeks Patterson et Al paper supports an R1b Bell Beaker expansion from Iberia circa 3.6 KYA. This can only have been L11 which gave rise to P312 in Iberia and U106 in Central Europe using the River networks already established by L51. I believe P312 later gave rise to DF27 and M167 in Iberia and U152 in the Alpine Region. This migration path is illustrated below. Age estimates are approximate. One thing I would tend to think is that their may have been a difference between the Meso groups in Europe anyway. Its generally thought that western and west-central Europe hunters spread out initially with the Magdallenian refugia while other epigravettian groups spread from the east. So in autosomal DNA terms they would not have been identical. They probably had similar very deep roots but there was a large degree of seperation and different environments too. I dont know if this corresponds to the divide in Atlantic-Baltic between NE European and Atlanto-Med or not but it seems a possibility to me. The hunters may often have been a mix of both because Madgallenian is thought to have partly been the result of an injection of new people from central Europe to the east (Badegoulian) and of course after the LGM the two groups also may have overlapped across a significant part of northern Europe. 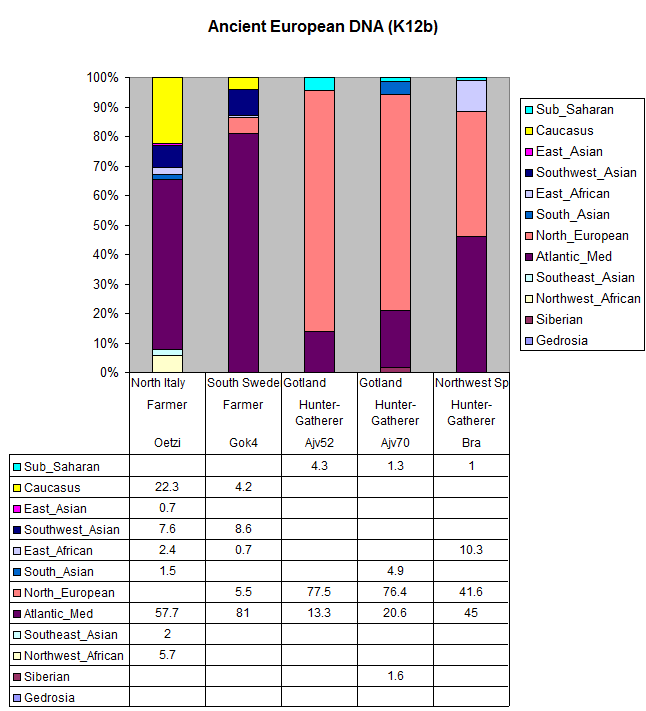 So, I would expect a mix of western and eastern Meso elemetns in most areas (even the Finns and Basque are connected by MtDNA. I dont follow the autosomal stuff much but is it feasible that both NE European and Atlantic Med. elements are Meso?